The early 20th century craze for postcards led to some very strange ideas. The early 20th century craze for postcards led to some very strange ideas. 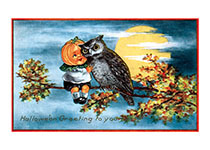 This is one peculiar Halloween greeting.